Pumpkin curry is a delicious, sweet and spicy curry. Pumpkin is a healthy vegetable with lots of beta carotene in it. 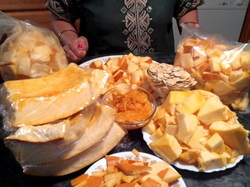 Cut the pumpkin into about 1 inch pieces. 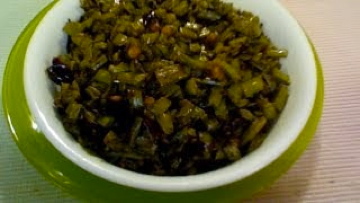 Cut green chilies into small pieces. While stirring do not crush the pieces. Place a thick bottom skillet on medium heat. Take ghee or oil in the skillet. When the oil is hot add chana dal, urad dal, mustard seeds, cumin seeds and green chillies. Keep stirring. When the mustard seeds are spluttering add crushed red chili, hing/asafoetida and curry leaves. Then add pumpkin pieces, salt & turmeric and give a stir. Cover it and cook on low medium to medium flame for 5 minutes. 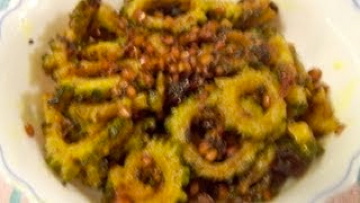 After 5 minutes give a stir and add jaggery or brown sugar and tamarind juice. While stirring do not crush the pieces. Again cover and cook on low medium for about 5-6 minutes until the pumpkin is soft but not mushy. Add cilantro when it is done. Add 1 tsp of ghee also on the top of the curry to give an extra flavor. Enjoy the sweet and spicy Pumpkin curry with rice or chapati or puri.